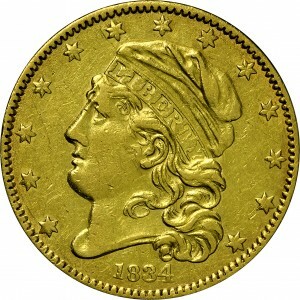 This example is a second variety of 1834 with plain 4 in the date with a different reverse die than HBCC-3165. 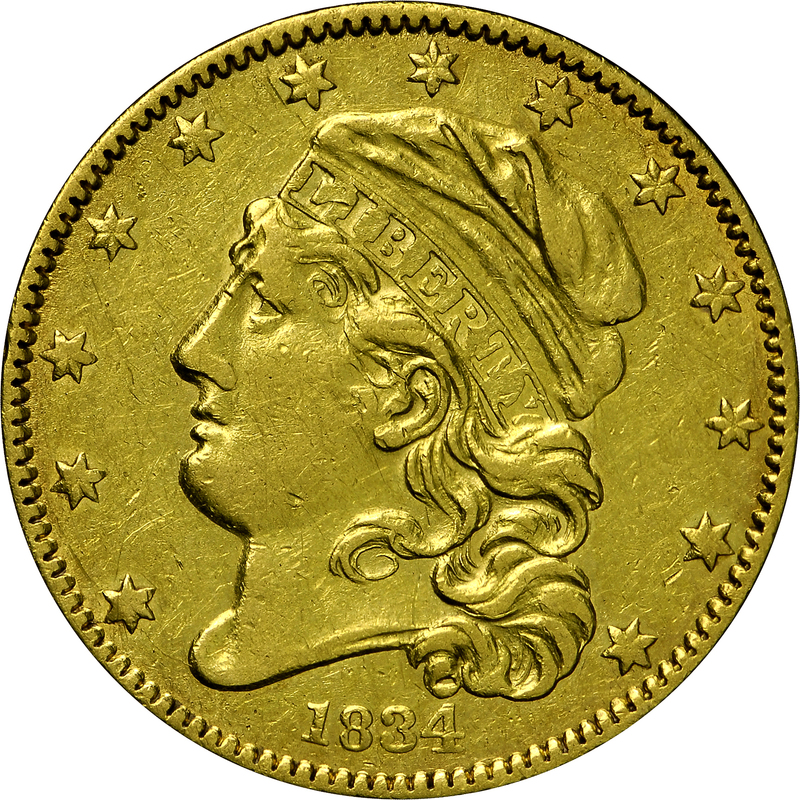 This reverse is the same die used to produce the 1834 Crosslet 4 example displayed at HBCC-3166, but in a later die state with this obverse. 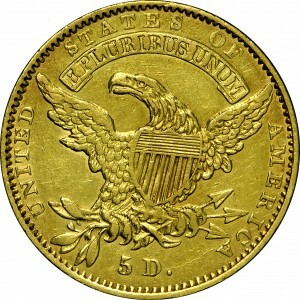 These 1834 Capped Head half eagles are the last issue of the design, prior to a weight reduction that took effect August 1, 1834, after passage of the Mint Act of June 28. From Stack's sale of the Rosen Collection, September 1968, Lot 340. "Obverse: Plain 4, leaning right. Short, sharp tipped 1. Crossbar of 8 imperfect. 4 centered under heavy, full curl. Die crack tip of bust - star 1 - edge. 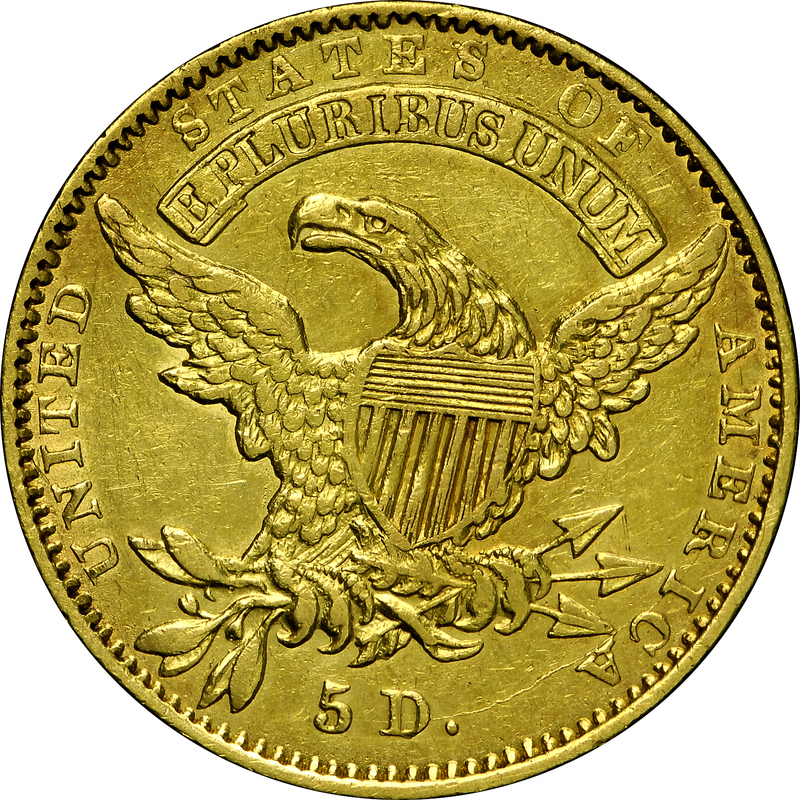 Reverse: 5 D . well toward leaves relative to A. Period narrow. Tip of middle arrowhead below left serif of I. Tip of lowest arrowhead points between C A. E well left of being centered over B - over B and right tip of I. Rear claw complete, attached beneath top leaf pair. Circular die crack thru MERICA and 5 D. Extensive rust roughness between lower shield stripes. Lapping of this roughness appears to indicate that 1(b)/B(b) was possibly minted after 2(b)/B(a)."